Here are our go-to tips for smoking on your Weber Kettle. Now that you have the right tools, let's get your kettle set-up for smoking. The most useful way to set up your charcoal grill for smoking is to create a two-zone fire. That simply means you arrange the coals on one side of the charcoal grate and leave the other side empty, giving yourself two heat zones. One will have direct heat and the other will have indirect heat. 1. Before you light the charcoal, find out how much wood the recipe suggests and soak wood chips in water for at least 30 minutes so that they will smolderand smoke rather than flame up (no need to soak wood chunks). Light the charcoal, follow these tips if needed. More often than not, you will need only a small bed of charcoal for smoking, so start with the chimney filled about halfway. The swinging handle above the chimney starter is there to help you lift and aim the chimney where you want it. Be sure to wear insulated barbecue mitts when handling the chimney starter. 2. Pour the lit charcoal on one side of the charcoal grate, either right onto the grate or into a charcoal basket. Put the empty chimney starter on a heatproof surface away from children and pets. 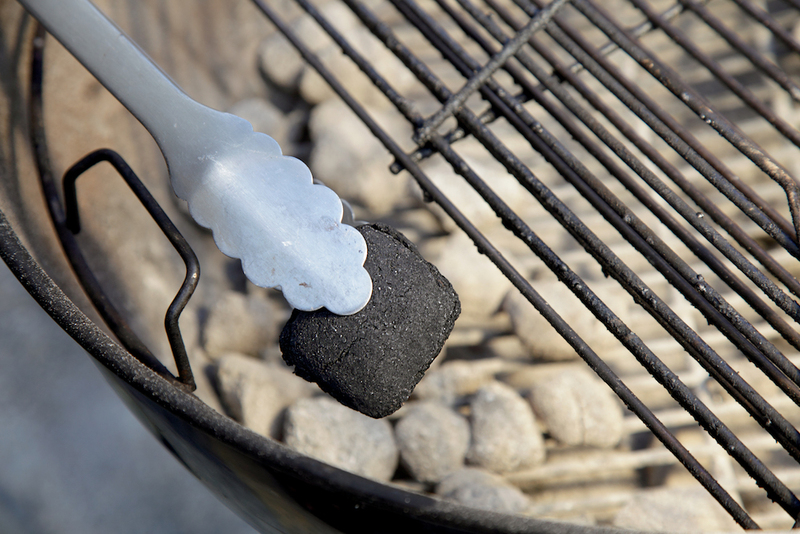 If the coals are not in a charcoal basket, use long-handled tongs to arrange them so that they cover one-third to one-half of the charcoal grate. It’s okay if the coals are piled one or two coals deep, but no more than that. Remember, you will probably need medium or low indirect heat, so start with a small amount of charcoal and add more later as needed. 3. 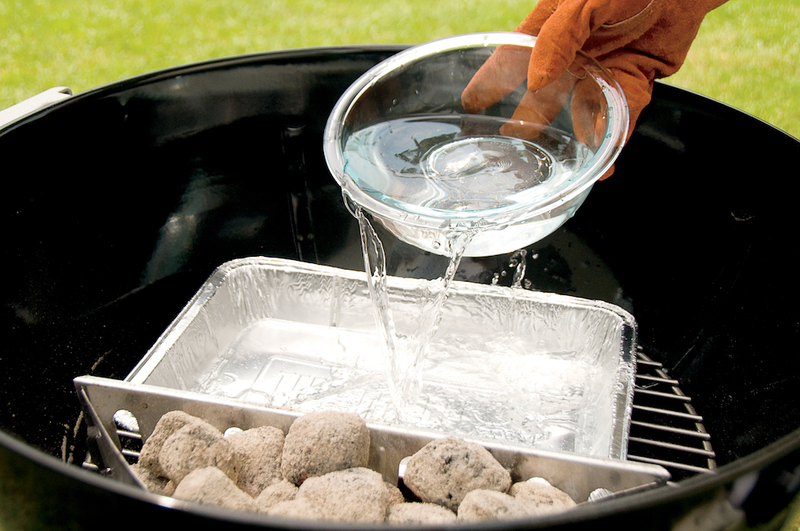 For recipes that involve more than 30 minutes of cooking time, place a water pan on the empty side of the charcoal grate. Fill the pan about three-quarters of the way with water. The pan will catch any juices and fat from the food. Plus, the water will absorb and release heat slowly, evening out the temperatures and adding a bit of moisture to the smoking process. Make sure to sweep away any ashes that have accumulated on the bottom of the bowl, and leave the bottom vents open all the way. Now preheat the grill. 4. Put the cooking grate in place (if the grate has hinged sides, arrange one of the hinged sides over the charcoal so that it will be easy to add more charcoal later without taking the grate off the grill). Then put the lid on the grill and open the top vent completely. Now wait until the temperature reaches the right range for the recipe you are making. Keep in mind that as the charcoal burns, the temperature will drop. When the temperature reaches the upper end of your desired temperature range, remove the lid and use a long-handled grill brush to scrape off any bits and pieces of food that may be sticking to the cooking grate. 5. 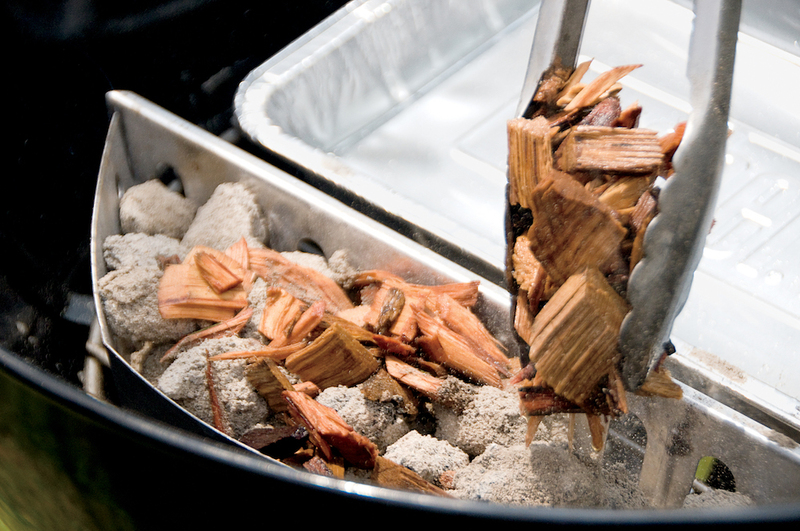 Drain and add the required amount of wood chips evenly over the charcoal. The chips should be damp but not so wet that they could put out the fire. The damp chips will initially drop the temperature of the fire, but the heat will recover once the chips begin to smolder. Put the lid on the grill and wait for smoke to start pouring out of the grill. Open the lid and arrange the food on the cooking grate as the recipe suggests. Close the lid and position it so that the vent is on the side of the grill opposite the charcoal; this will draw the heat and smoke over the food and out the vent. 6. If you will be cooking for more than 30 minutes, you will probably need to add more charcoal over time. If you are using standard charcoal briquettes, add them when they are fully lit, because the taste of food sometimes suffers when it absorbs the aromas of partially lit briquettes. Fortunately pure hardwood charcoal and hardwood briquettes don’t produce any unwanted aromas in the early stages of their burning, so you can add those to the fire when they are unlit or lit. The grill vents control the airflow. The more air flowing into the grill, the hotter the fire will grow and the more frequently you will have to replenish it. To minimize that, keep the lid closed as much as possible, but the vents on the bottom of the grill should (almost always) be left open whenever you are cooking. To slow the rate of your fire’s burn, close the top vent as much as three-quarters of the way. All kinds of charcoal, especially briquettes made with fillers, will leave some ash after all the combustible carbon has burned. If you allow the ashes to accumulate on the bottom of the grill, they will eventually cover the vents and starve the coals of air, eventually putting them out. So, every hour or so, give the vents a gentle sweep to clear them of ashes. Now you have the tips to smoke on your kettle. To get more inspiration check out our other blogs here. Happy smoking! Tips adapted from Weber's Smoke ©2012 Weber-Stephen Products LLC. Used with permission.